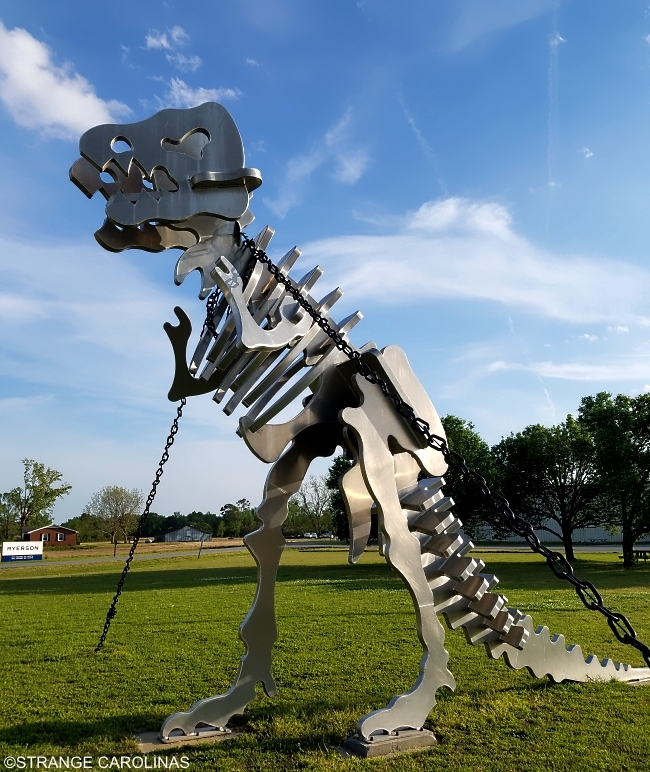 The dinosaurs at Benton & Sons Fabrication Company are the creation of owner Ben Benton, Jr. 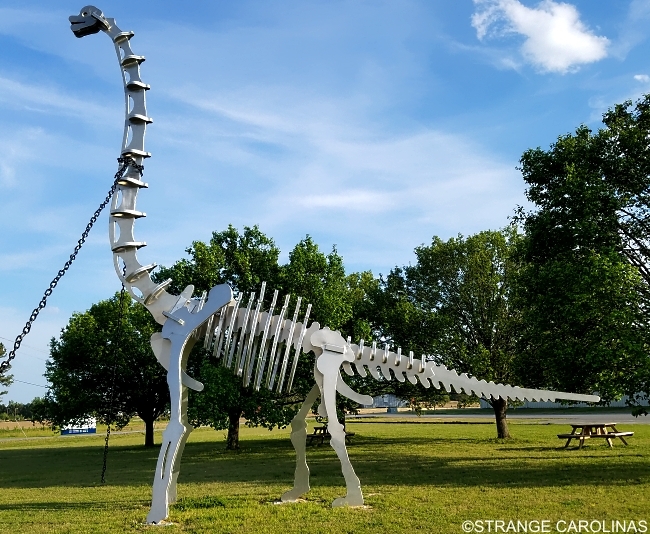 The dinosaurs are massive works of art and truly worth a trip to see in person. There are three on display at the company and one in downtown Goldsboro. We had to know more about the dinosaurs, so we tracked down Ben and he gave us all the details. The T. Rex was your first dinosaur. How did that come to be? I was trying to draw attention to my sign out in front and keep my guys busy when things were slow. I had cut a small one and I decided, "Well, I"ll make one eighteen feet tall." Did you run into any troubles at all during the creations of the T. Rex? At the time I built that, my father still owned the company. We talked about it a couple months prior to me building it. I told him I was thinking about building a life-sized T. Rex and he said, "That would be cool." I guess when he saw it on the floor, all in pieces and everything, he was probably beside himself. Other than that, we didn't really run into any problems. He named it for me originally, but we've changed his name since then. He called it Useless. For a little while, his name was Useless, but everyone else that saw it thought it was awesome. That's pretty much what they call him now, Awesome. The Stegosaurus came next. How did he come about? Just another slowdown. A lot of people liked the T. Rex. These guys here are highly trained and I have years and years invested in them. When things get a little slow, I try to keep them doing something profitable. If I can't do anything profitable, then we build dinosaurs. Did he present any problems? There was a minor problem at the end of construction. He was supposed to be about fourteen foot something tall and about thirtty-two feet long. 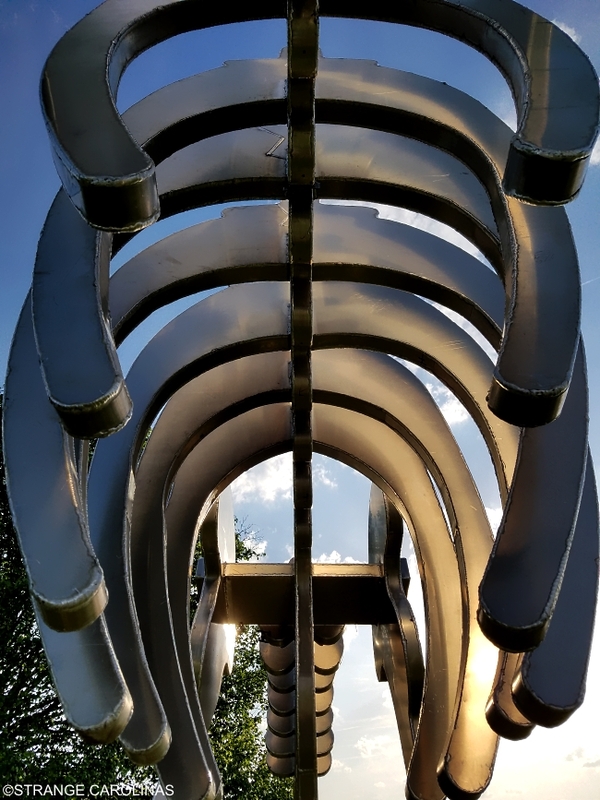 After we did the final weld on it, he shrank to twenty-nine feet long and a little over fifteen feet tall. We had a time getting him out of the shop. They had to turn him catty-cornered and we ended up breaking his tail off trying to get him out of the building. Of course, with reptiles, their trails grow back so it was okay. 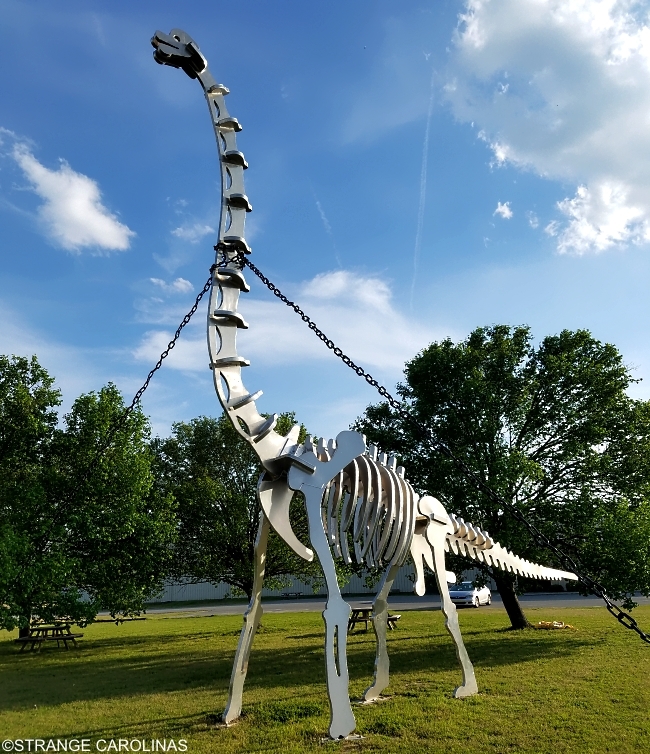 Your newest one, what kind of dino is that? He's twenty-seven feet tall. He did not take all that long to build. But he laid around for a year and a half. Like I said, I'll put them up when I get busy and I'm able to make money. I'll throw them aside until everything slows back down again and we have a lull. Then I'll bring them back out and finish. 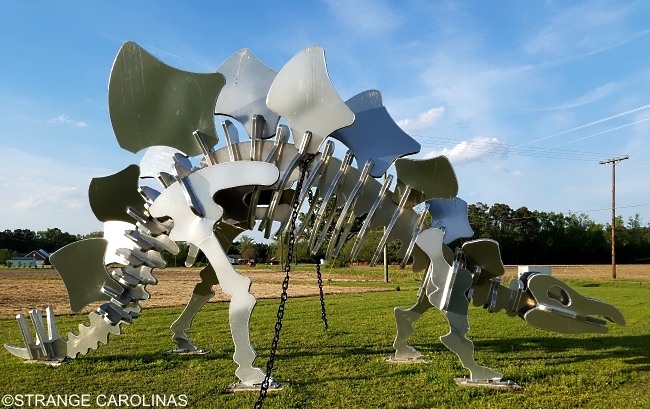 You have a fourth dinosaur displayed in downtown Goldsboro. What can you tell us about the Dilophosaurus? The city called me. They display art on Center Street and they wanted to know if they could lease one of mine out here. I told them they were too big to haul. But I told them I would build them one and rather than lease it to them, I will let them borrow it indefinitely so they wouldn't have to pay for it and I get a little free advertisement out of it as well. They change those out every year, so it will be interesting to see if they actually keep this one. The Art Council said they like to change them out unless they find something they really like and then they purchase it. I hope it stays up but if not, I have some others interested. I've had a restaurant contact me right on 95. He wants me to put one out there, but we haven't talked about pricing or anything. They're very labor intensive. They're hollow. Basically, two flat sheet and a wrapper that goes around each block. Then you take all the blocks and stick them together. I think I had just over 600 man hours in the Stegosaurus. Any other dinosaurs in the works? We're planning on one more. If this economy doesn't kick up a little bit, we're going to be working on it real soon. I'm a little unsure of what it will be. I am planning on trying to market the ones I've done as far as smaller replicas. I don't know how that's going to work either. We're trying to make it cost effective. So what does your dad think of them now? Oh, he likes them. He hears about them all the time. Everybody's always telling him how cool they are.